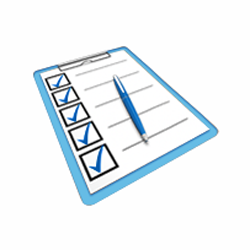 These checklists can be customized and downloaded, or they can be stored in My BOX. They can be printed and filled out by hand, or they can be filled out online and then saved to the computer. Human errors occur daily, everywhere and in many different constellations (1). As long as humans are involved in any kind of processes, there will be no discipline unaffected by human failures. These are not new findings since we have always known that “To Err Is Human” (2). In the medical field, human errors can lead to minor local or major general complications that may cause the death of the patient. This already led to the proposal of surgical safety check lists by the World Health Organization (WHO) (3, 4). Surgical safety checklists can function as barriers for the occurrence of human errors and improve the sharing of patient-related medical information between team members (5). Consequently, significantly reductions in death and peri-operative complications have been achieved (6). Nowadays, a patient safety culture is on the rise in a variety of disciplines (7, 8). This especially relates to medical disciplines i.e. anaesthesiology and surgery (where procedures are mainly performed under general anaesthesia) (9, 10). However, also minor medical procedures, as well as dental treatments, can be affected by human errors and lead to harm. Therefore it's also time for dental professionals to become more familiar with the general context of patient safety and to establish a patient safety culture in daily practice. In primary care dentistry, data concerning the incidence of complications occurring in daily practice, as well as reports about the implementation of safety measures, is infrequent and the improvement of patient safety is a concept with a distinct lack of evidence base (11). Since modern dentistry has become increasingly sophisticated, and this in turn has increased the risk to the patient, patient safety can be considered as a comparatively new discipline (11, 12). In dentistry, the main incidents known from the current literature include the following: injuries (10%), medical emergencies (6%), inhalations/ingestions (4%), adverse reactions (4%) and wrong site extractions (2%) (12). Interestingly, most of these complications are due to human errors (36%) and a significant amount of iatrogenic harm occurs not during treatment, but through controllable pre- and post-procedural check-ups. It has been shown that checklists can reduce human error based incidents by improving team communication and directly lead to minimizing surgical related risks with an increase in implant success rates (13). This video, as well as a French version are also available in the library. Reason J. Human error: models and management. West J Med. 2000 Jun;172(6):393-6. PubMed PMID: 10854390. Pubmed Central PMCID: 1070929. Donaldson MS. An Overview of To Err is Human: Re-emphasizing the Message of Patient Safety. In: Hughes RG, editor. Patient Safety and Quality: An Evidence-Based Handbook for Nurses. Advances in Patient Safety. Rockville (MD)2008. Helmio P, Blomgren K, Takala A, Pauniaho SL, Takala RS, Ikonen TS. Towards better patient safety: WHO Surgical Safety Checklist in otorhinolaryngology. Clinical otolaryngology : official journal of ENT-UK ; official journal of Netherlands Society for Oto-Rhino-Laryngology & Cervico-Facial Surgery. 2011 Jun;36(3):242-7. PubMed PMID: 21481197. Epub 2011/04/13. eng. Braham DL, Richardson AL, Malik IS. Application of the WHO surgical safety checklist outside the operating theatre: medicine can learn from surgery. Clinical medicine. 2014 Oct;14(5):468-74. PubMed PMID: 25301905. Epub 2014/10/11. eng. Tang R, Ranmuthugala G, Cunningham F. Surgical safety checklists: a review. ANZ J Surg. 2014 Mar;84(3):148-54. PubMed PMID: 23601094. Nishiwaki K, Ichikawa T. [WHO Surgical Safety Checklist and guideline for safe surgery 2009]. Masui. 2014 Mar;63(3):246-54. PubMed PMID: 24724433. Kapur A, Potters L. Six sigma tools for a patient safety-oriented, quality-checklist driven radiation medicine department. Practical radiation oncology. 2012 Apr-Jun;2(2):86-96. PubMed PMID: 24674084. Epub 2012/04/01. eng. Wischet W, Schusterschitz C. Quality management and safety culture in medicine - Do standard quality reports provide insights into the human factor of patient safety? German medical science : GMS e-journal. 2009;7:Doc30. PubMed PMID: 20049068. Pubmed Central PMCID: 2795368. Epub 2010/01/06. eng. Brichant JF. [The Helsinki Declaration on Patient Safety in Anaesthesiology]. Acta anaesthesiologica Belgica. 2010;61(2):49. PubMed PMID: 21155436. Epub 2010/12/16. eng. Arfanis K, Fioratou E, Smith A. Safety culture in anaesthesiology: basic concepts and practical application. Best practice & research Clinical anaesthesiology. 2011 Jun;25(2):229-38. PubMed PMID: 21550547. Epub 2011/05/10. eng. Bailey E, Tickle M, Campbell S. Patient safety in primary care dentistry: where are we now? British dental journal. 2014 Oct;217(7):339-44. PubMed PMID: 25303580. Epub 2014/10/11. eng. Thusu S, Panesar S, Bedi R. Patient safety in dentistry - state of play as revealed by a national database of errors. British dental journal. 2012 Aug;213(3):E3. PubMed PMID: 22878337. Epub 2012/08/11. eng. Perea-Perez B, Santiago-Saez A, Garcia-Marin F, Labajo Gonzalez E. Proposal for a 'surgical checklist' for ambulatory oral surgery. International journal of oral and maxillofacial surgery. 2011 Sep;40(9):949-54. PubMed PMID: 21600734. Epub 2011/05/24. eng.